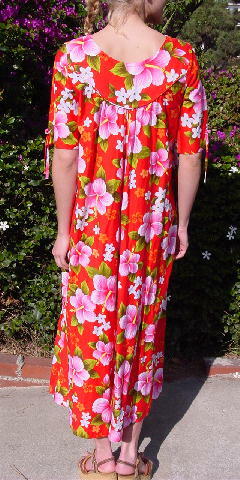 This short sleeve dress is 100% cotton and was made in Hawaii. It has a wide rounded neckline. The sleeves have two 6 1/2" ties dangling from each sleeve and a 3 1/4" long tie strip sewn in two places on the top of the sleeve. The dangling ties are on each end. The right side has a side seam open slant pocket. There is a yoke running along the front and back with gathering extending downward in front and in back. It has an orange-red background with flowers and leaves in coral pink, sunshine yellow, lime green, white, Spanish olive, medium brown, black, peach, coral-red, and gray. A stylist used it for a luau party. shoulder to shoulder 14 3/4"
shoulder to end of sleeve 12"